I did all of this to prepare for an eventual shift from WordPress to some other platform, preferably one that is based on generating static HTML files that I can upload to my host. I’d like to be able to go 100% static if I so choose once the conversion is done, because I like making pages by hand and updating links. Unfortunately, as I’ve said in a previous post, I don’t have time for this now. 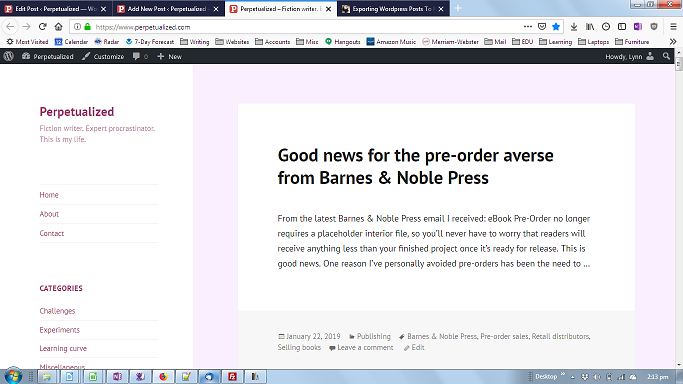 On my other sites, the excerpts occupy a reasonable portion of screen real estate. Here, one short excerpt pretty much takes up the entire screen on my desktop. What I really want is custom pages with links or text that I link out to my archived content (in place of the tag and category pages), and an archive list of posts by date the way I have now. Since I can’t have that without too much work or changing themes, I’m just going to go back to full posts. *I put the date archive pages back when I realized the links on my calendar widget don’t work without them. I don’t know what that’ll mean for my shift to a static site someday, or if I’m even still planning one. I’ll leave that decision for later.